Aug 7, 2015 • [By Idaho State University Marketing and Communications] Idaho State University and NASA researchers teaming up with the Bureau of Land Management used satellite imagery to identify increased wildfire susceptibility due to the invasion of cheatgrass on rangelands. 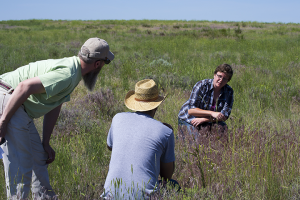 The Idaho Disasters III Project Team working at ISU’s GIS Training and Research Center, one of only eight regional NASA DEVELOP Nodes in the United States, created reliable map images that BLM managers can use to identify cheatgrass infested areas. The map covers a large swath of eastern Idaho. The researchers have been using new imagery collected by the Landsat 8 satellite, a collaboration between NASA and United States Geological Survey, which was launched in February 2013. The new maps have a variety of uses. Land managers can use this type of information to plan prescribed fires, fuel treatments, and other wildfire prevention/rehabilitation programs. In addition, the models may be used to assess the overall land health. Jeff May, the lead on this DEVELOP project, gave a project presentation this July in Washington, D.C. at the NASA Applied Science Application Showcase, which highlights NASA DEVELOP achievements. The DEVELOP team working on this project at ISU included Weber, May, Zachery Simpson, an ISU graduate who will be pursuing a GIS certificate this fall, and Jenna Williams, from northern Colorado who will be taking over node leadership at ISU for the DEVELOP program beginning this fall. 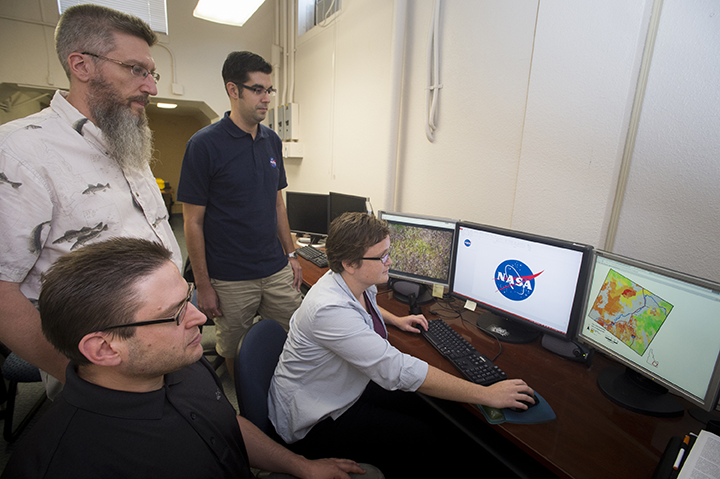 Simpson will take the lead on the next NASA DEVELOP project at ISU, which will be a two-term, 20-week project using high resolution images and geospatial technologies to look at juniper encroachment on public lands and how juniper stands have changed over time. That project will be started this fall and finished next spring. The juniper encroachment mapping project will include input and participation by the Idaho Department of Fish and Game’s Mule Deer Initiative as well. This entry is filed under Disasters, Ecosystems and Biodiversity, Fire, News, Video.